Last week the European Space Agency organized the fifth Advances in SAR Oceanography workshop, SeaSAR 2018, in Frascati, Italy. The Nansen Center was well represented with a delegation of 5 participants. The second Sentinel-3 satellite, Copernicus Sentinel-3B, has been launched and has joined its identical twin Sentinel-3A in orbit. This pairing of satellites increases coverage and data delivery for the European Union’s Copernicus environment program. It is also good news for research at NERSC. In 2014 Kristoffersen set out on a 12-month polar expedition in a small hovercraft (R/H SABVABAA) together with the experienced ice-sea adventurer, Audun Tholfsen. All this happened under the direction of Kristoffersen's long-standing workplace The Nansen Center in Bergen. The Nansen-Zhu International Research Center (NZC) and it`s partners celebrate 15 years of collaboration with rock solid science. Last week the Norwegian Minister for Research and Higher Education, Iselin Nybø, visited NZC during a 15-year collaboration ceremony. The seminar was highlighting the main research activities for collaboration between the Norwegian and Chinese partners during the past 15 years. Future scientific challenges were also addressed. This week 221 registered participants from a Norwegian education and research delegation will visit China. The Minister of Research and Higher Education, Iselin Nybø, is leading the delegation and the Nansen-Zhu Centre in Beijing will be one of the hosts on the program. The delegation includes strong participation from former and existing partners of the Nansen-Zhu International Research Centre (NZC) in Bergen. Tidligere har det blitt kjent at direktør og professor, Sebastian H. Mernild, ved NERSC har blitt utpekt som en av hovedforfatterne for den sjette hovedrapporten til FNs klimapanel (IPCC). Nå er det offisielt at han er en av 19 forskere fra Norge som skal jobbe med rapporten, i følge Miljødirektoratet og IPCC. Rapporten, som publiseres i 2021 og 2022, regnes som det viktigste vitenskapelige grunnlaget for internasjonal klimapolitikk. The publication Delineation of marine ecosystem zones in the northern Arabian Sea during winter, resently published in Biogeosciences, is a result of collaboration between the Nansen Centers in India, Norway and South Africa. It was inititated under the EU FP7 project Indo-Mareclim: Indo-European research facilities for studies on marine ecosystem and climate in India, coordinated by the Nansen Center in India. It is with deep sorrow that Nansen Environmental Research Centre – India (NERCI) in Cochin, India and the Nansen Center in Bergen report the sad and unexpected demise of Prof. (Dr.) N.R. Menon on Sunday 18th March 2018. Prof. N.R. 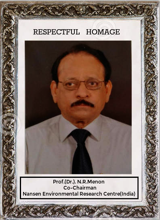 Menon was the Co-Chairman of the Board of Directors of NERCI and Dean, Faculty of Climate Variability and Aquatic Ecosystem, Kerala University of Fisheries and Ocean Studies (KUFOS). We have the pleasure of launching version 1.0 of Nansat. This is possible after a three week long and intensive Scrum sprint performed by Anton Korosov, Aleksander Vines, Jeong-Won Park, Artem Moiseev, and Morten Wergeland Hansen. A scrum sprint is an agile software development method that was now for the first time employed at NERSC. It has shown to be very useful and efficient, and will certainly be repeated for the next versions of Nansat. Denne uken samles 160 forskere, forskningsledere, representanter fra Norges forskningsråd, næring og forvaltning samt internasjonale samarbeidspartnere i Tromsø. De skal markere oppstarten av det nasjonale forskningsprosjektet Arven etter Nansen. 130 forskere innen fagdisipliner som spenner fra marine bakterier og torsk til luft- og havstrømmer er denne uken samlet i Tromsø. De markerer starten på det unike forskningsprosjektet Arven etter Nansen. Arven etter Nansen er et nasjonalt forskningsprosjekt med en budsjettramme på 740 millioner kroner, som skal møte store, sammensatte, fremtidige utfordringer med nyskapende forskningssamarbeid. Ti institusjoner er involvert i prosjektet og blant disse er Nansensenteret. 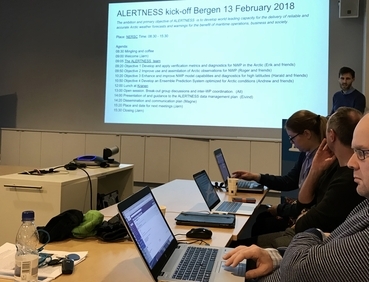 Yesterday NERSC hosted a kick off meeting of a new big national project called ALERTNESS (Advanced models and weather prediction in the Arctic: New capabilities from observations and polar process representations). ALERTNESS is a large-scale national research project with the total funding of 23 million NOK. Norges forskningsråd har godkjent forskningssøknaden til Arven etter Nansen. Første tokt går 19. juli 2018 med det nye forskningsfartøyet «Kronprins Haakon». research grant and stayed at Technical University of Vienna. Professor and director at NERSC, Sebastian H. Mernild, has been a lead author and contributing author to a new SWIPA-report (chapter 6 and 10). 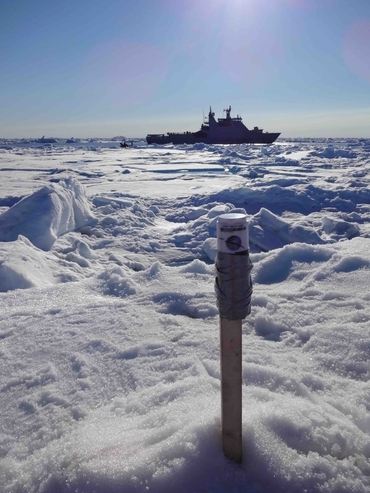 This report presents the findings of the Snow, Water, Ice and Permafrost in the Arctic (SWIPA) 2017 assessment performed by the Arctic Monitoring and Assessment Programme (AMAP). (Summary for Policy-makers report is reproduced in this report on pages vii to xiv). Kronikk først publisert i BA 23.10.2017 av Helene R. Langehaug, klimaforsker ved Nansensenteret. 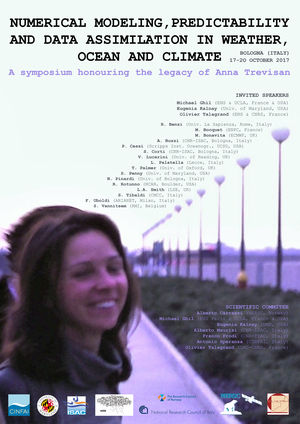 Nansen Center is among the sponsor of the international Symposium "Numerical modeling, Predictability and Data Assimilation in Weather, Ocean and Climate" - a Symposium honoring the legacy of Anna Trevisan. Prof. Anna Trevisan was a leader a pioneer scientist in the broad area of dynamical system applications to geosciences and numerical modeling of fluids. She has also trained many students and postdocs and contributed actively to increase the role and presence of women in the academies. She passed away on early 2016.